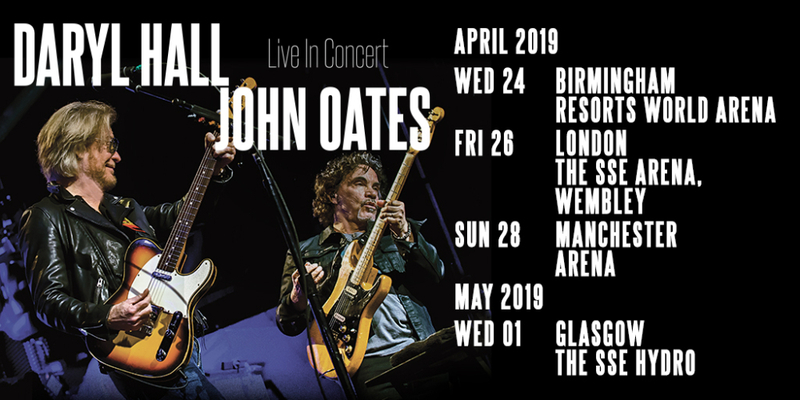 Daryl Hall & John Oates, the biggest selling music duo in HISTORY, have announced four arena shows through the UK in April and May 2019. This will be the first Daryl Hall & John Oates headline tour in the UK for five years. After another incredible touring year, which included such legendary venues as Madison Square Garden and The Forum, Daryl Hall & John Oates will will return to the U.K. for three dates in April, including the Resorts World Arena in Birmingham (Wednesday 4/24), London’s Wembley SSE Arena (Friday 4/26) and the Manchester Arena (Sunday 4/28). DARYL HALL - JOHN OATES TICKET EXPERIENCES!